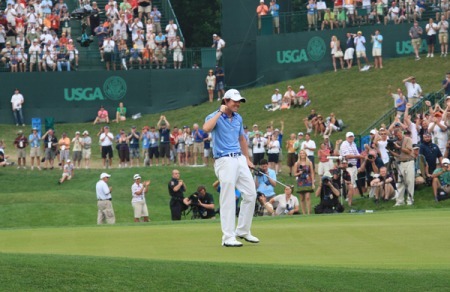 Rory McIlroy became the first man in US Open history to get to 13 under par. Credit: golffile.ieRory McIlroy has impressed his rivals with his play over the first two rounds at Congressional Country Club. Leading on 11 under par after rounds of 65 and 66, some players even appear to be cheering him on following his Masters meltdown in April. Q. Could you put into words what Rory is doing out there? Sergio Garcia: He’s just playing great, simple as that. Q. Based on what happened to Rory at Augusta, is there part of you that’s actually sort of rooting for him? Sergio Garcia: Definitely. I think it would be great for him to win. He’s a wonderful player, very nice kid. I get along very well with him, too. It would be nice. Even if what happened at Augusta would have not happened, it would be nice for him to win. I think he deserves it, and hopefully he’ll be able to do it. Q. Having to chase someone that’s so far in the lead, does that change your plan of attack? Sergio Garcia: Not at all. I have bigger worries than Rory McIlroy. “He’s really not a thought in my mind at all. If he keeps playing the way he’s playing we’re all playing for second place. That many shot lead going into the weekend if he keeps playing the way he’s playing it’s going to be impossible to catch him. You’re trying to shoot the lowest number you can. I personally won’t look at the leaderboard all weekend because there’s no point. Just try to shoot as good as I can and find out how it stacks up on Sunday. “I think everybody would agree he’s probably got more talent in his pinky than I have in my whole body. He is unbelievably talented. I don’t know how old he is, 21, 22, shooting those kind of numbers and swinging the golf club the way he does and hitting it as solid as he does, he does everything well. I love watching him play because it’s a very classical, beautiful golf swing. Once he matures and starts being out here for a while and being in these kind of situations, I think he’s only going to get harder to beat. It’s fun to kind of watch him grow up. “I think anybody who makes people want to tune in and watch is a great ambassador, and Rory McIlroy makes people want to do that. He’s a great kid, got a great head on his shoulders, which is very hard to do with his lifestyle. The amount of talent and success he’s had at such a young age, he’s a great ambassador. You couldn’t ask for a better kid to be out there representing the game of golf. “Hopefully he doesn’t get too crazy on us, but if he does I’ll be playing for second place, which is not bad, either. “He’s two groups behind me, and I heard, oh, here we go. It’s cool to see after the Masters and what happened to him. He’s a good kid. At 21 years old, I couldn’t be out here. I know how hard it is to play out here, and to do what he’s doing is phenomenal. Q. Looking at what Rory did this morning, how marvelous was that? LEE WESTWOOD: Yeah, brilliant. It’s great golf. How many is he leading by? Lee Westwood: You have to play fairly well in a major to lead it by six at any stage. Q. When you look at that score, do you shake your head? Lee Westwood: I did say when we finished our round yesterday if you read the transcript that nobody had shot 5- or 6-under in the morning taking advantage of the golf course because it was there for the scoring. I thought they made it very fair, and if you hit fairways and you drive the ball well, you’re going in with a few short irons and you can attack the flags. … Q. When you go out on a weekend and there’s that kind of a gap, does it change the approach that you have when you go out like you have to go out and make another number? Lee Westwood: I’m more looking at Y.E. Yang, now who’s in second spot, trying to catch him, because if I’m going to win the tournament, then I’m going to need Rory to play poorly over the weekend. I might play great and shoot 11-under par and get to 10, but he’s still got to shoot — if he shoots level at the weekend then he wins. But when you’ve got a six-shot lead, as I know, because I’ve had a few six-shot leads, everybody gives you the tournament almost, so in everybody’s mind he’s probably already won it. They’re probably debating whether he’s already won it on TV. Q. Is it comparable to Pebble Beach in 2000 when people thought they were playing for second place? Lee Westwood: I think that’s the attitude I’m going to go with over the next couple of days to try and get past whoever is in the second spot, and we’ll see what Rory does. He’s had leads before. Q. What advice would you give to Rory going in with two rounds to go? Lee Westwood: I’m supposed to beat him over the next two days. I’m hardly going to give him advice, am I? “Rory is obviously running away with it so we are pretty much playing for second unless something crazy happens tomorrow. I hope he wins it though. He’s a nice person and he deserves it especially after the Masters. Q. If not for Rory, you wouldn’t be all that far off the lead. Steve Stricker: It’s crazy, isn’t it? He just hit it in the water, though, I saw at 18. But to be 13under, pretty incredible. But there’s a long ways to go yet. I mean, just got to keep hanging in there and keep trying to shoot under par. He’s got to come back. The way he’s playing now, it doesn’t seem like he’ll do that, but you’ve just got to keep fighting and see what happens. But pretty incredible what he’s done so far. Q. On the 9th tee, there was the big roar. What was that like out there? Did you think it was probably him?